I decided it’s time to jump on the bandwagon and start this blogging thing. For those of you who have no idea who I am, let me introduce myself and give you a little of my background. I live in Winnipeg, Canada and work in the family business. We have a kosher food store and a catering operation. I grew up in the business and it made sense to continue on with the parents after graduating from university (with a degree in hotel and restaurant management). Over the last few years, with me pushing and prodding the whole way, our business has changed focus. We up and moved our store to another part of our city (following the customers) and are building the grocery part of the business by leaps and bounds. Our years of catering several large functions (weddings, bar mitzvahs, etc.) are over – but the smaller functions and day-to-day catering has picked up tremendously. We have a lot of fun, and work like crazy. A few years ago I decided to push myself to get a cookbook written. I’d thought about it for a long time and didn’t really know how to get started. After writing 70 recipes, I put together a proposal and sent it out to numerous publishers across North America. A few offers came in, and I happily signed with Whitecap Books. An American company, M. Evans (now a part of The Rowman and Littlefield Publishing Group) bought the US rights. 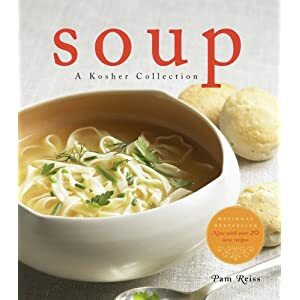 Another 70 recipes were created, tested and written up and my book, Soup: A Kosher Collection was published in the fall of 2004. Since then I’ve started writing a bi-weekly recipe column for a local paper and have had several columns published in other papers across North America. My plan is to continue to work on recipes – and I’ll share some of those with you here – and hopefully get another book put together. I’ll also use this space to share my thoughts about cookbooks and other food books and point you in the direction of things that catch my interest. I hope you enjoy visiting and contribute to the conversation.